Our NEW switchable Comb Marker Generators are now available. They provide switchable frequency pairs of 50 and 500 KHz, 5 and 10 MHz and 10 and 100 MHz. Other frequency combinations can be made available. Send your requirements to sales@hsmicrowave.com for a prompt quote. 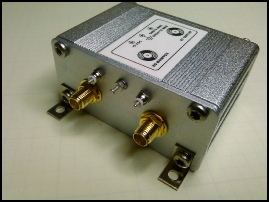 Our NEW 10.368 GHz to 618 MHz Down Converter uses the NXP TFF1014 MMIC and is designed to work with the wideband SDR’s that will work at 618 MHz. The Model KU-MULT is a X8/X16 Multiplier with an output frequency range of 18 to 24 GHz. It is designed to take a L or S band signal source and provide a low noise local oscillator in Ku-Band.